OS grid reference SC 3050 7650. In a field called Magher-y-Chairn just west of the B35 road between Braaid and Crosby, in the parish of Marown, Isle of Man, and north of Garth farm are three standing stones stood together that are known locally as St Patrick’s Chair or Chairn-y-Pherick. Two of the slabs have early Christian crosses carved on them. In the same field is a holy well. Local legend has it that St Patrick came to preach here in the mid 5th century AD, but actually there is no hard evidence to support this. However, three Irish bishops – namely St Runius (Ronan), St Lonan and St Connachan (Onchan) are said to have lived and possibly died here. Indeed, they may lie in St Runius’ churchyard at Kirk Marown, about half a mile to the north-east. 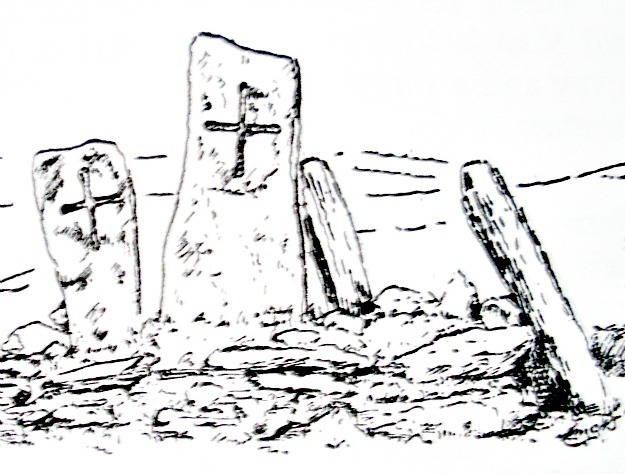 Also in that churchyard at the east end of the old church are the remains of a keeill, a primitive chapel dating from the early Christian period. The parish of Marown (Ma-Ronan) takes it’s name from the saint; and the town of Douglas is 4 miles to the east. Originally there were five granite standing stones here but two have now fallen over and they lie amongst a jumble of other stones that may have once formed a burial site. Two of the slabs have simple but intricately carved thin crosses on their front faces from the early Christian period. It would appear that early missionaries have christianised these stones at some point between the 7th-9th centuries AD, as the standing stones themselves almost certainly pre-date Christianity by a few thousand years, making them prehistoric in age. Was this the meeting place for early Christians, or was it the burial place for an ancient chieftain? who knows! At the south-eastern side of the very same field is a holy well called Chibber y Chairn (Well of the Chair), also known as St Ronan’s Well. Local legends say that St Patrick himself came here and used the stones as a seat to preach from in the 5th century AD; however this cannot be substantiated and is thought highly unlikely, but it is likely that Irish bishops preached in front of the stones – one bishop in particular could well have been St Ronan, known locally as St Runius or Runy (Ma-Ronan) who founded a tiny chapel (keeill) a short distance to the north-east in the 7th or 8th century? and has given his name to Marown parish. His feast-day is still celebrated in the Isle of Man on 7th February. He was apparently third bishop of Man following St Maughold (d 498) who “was” a convert of St Patrick. Whether this St Ronan is one and the same as St Ronan, bishop of Kilmaronen in Lennox, Innerleithen, Scotland, is uncertain, but ‘he’ is credited with attending the famous Synod of Whitby in 664 AD, according to the Venerable Bede. The remains of the saint’s humble little chapel, built from wattle and daub with earthen walls stone-faced on the inside and roughly measuring 16 feet by 10 feet, can be seen at the east-side of St Runius’ old church. The little building dates from c1200 AD, but was enlarged and then rebuilt in the mid 18th century. It eventually fell in to decay only to be restored and re-opened again in 1959 by local people. Housed within are some crude Manx-style crosses, one of which was found beneath the porch. Could it be that these crosses once marked the resting places of the three Irish saints? This is certainly a very holy site. The Manx Museum And National Trust, The Ancient And Historic Monuments of The Isle Of Man, Fourth (Revised) Edition, Douglas, 1973. Farmer, David., Oxford Dictionary Of Saints, Oxford University Press, Oxford, 2004. Categories: Inscribed Stones, St Patrick's Chair at Marown Isle of Man, Standing Stones | Tags: St Patrick's Chair at Marown in Isle of Man | Permalink.